Founded in 1947, Defenders of Wildlife is one of the country's leaders in science-based, results-oriented wildlife conservation. We stand out in our commitment to saving imperiled wildlife and championing the Endangered Species Act, the landmark law that protects them. 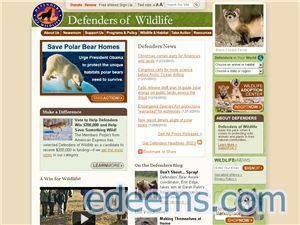 Defenders of Wildlife is a national, nonprofit membership organization dedicated to the protection of all native animals and plants in their natural communities. We work to protect and restore America's native wildlife, safeguard habitat, resolve conflicts, work across international borders and educate and mobilize the public.